Back in March I landed an incredibly fragrant and fresh white truffle on one of my frequent trips to Italian traiteur Feduzzi. This weekend I got lucky again. 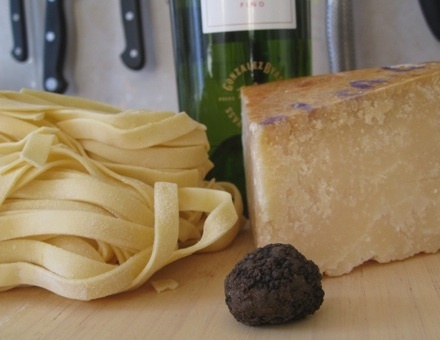 Feduzzi was offering black summer truffles from a fresh delivery from Italy. And like last time, dinner plans were quickly adjusted to Tagliatelle with a sherry and Parmesan sauce and raw shaved truffles. The black truffles were not as intense as the white ones and pricey at € 40,= for 10 grams. We still enjoyed them a lot! Recipe is super simple: Make not too strongly-flavored creamy sauce (butter, parmesan, heavy cream). Cook fresh tagliatelle al dente. Pour sauce over pasta. And then grate the raw, cleaned truffles over the sauce. 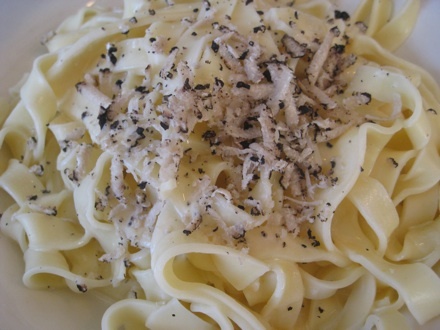 Only difficult thing is finding fresh truffles and good quality tagliatelle and parmesan. At least in Amsterdam. We’ll make some for you on your next visit!